Suedois (Le Havre) wins The Shadwell Turf Mile (G1 "Win and You're In") at Keeneland on 10.07.2017. Danny Tudhope up, David O'Meara trainer, George Turner and Clipper Logistics owners. Four graded stakes winners from Keeneland's 2017 Fall Stars Weekend, including Suedois (FR), who took the $1 million Shadwell Turf Mile (G1), are among the list of horses nominated to this year's Fall Stars Weekend on Oct. 5-7, opening weekend of Keeneland's 17-day Fall Meet that runs through Oct. 27. Fall Stars Weekend features 10 stakes, nine of which are graded, worth $3.95 million. Five of those races are Grade 1 events, and nine of them are Breeders' Cup Challenge races that are “Win and You're In” contests for the Breeders' Cup World Championships at Churchill Downs on Nov. 2-3. The 33rd running of the $1 million Shadwell Turf Mile (G1), for 3-year-olds and up and a Win and You're In race for the $2 million Breeders' Cup Mile (G1), drew 31 nominations and will be run Saturday, Oct. 6. Owned by George Turner and Clipper Logistics and trained by David O'Meara, Suedois won last year's Shadwell Turf Mile by a half-length over Heart to Heart, who also is nominated to this year's race. In addition to Suedois and Heart to Heart, winner of this spring's Maker's 46 Mile (G1) at Keeneland, other Grade/Group 1 winners nominated to the Shadwell Turf Mile are Almanaar (GB), Divisidero, Lightning Spear (GB) and Voodoo Song. The other defending champions nominated to Fall Stars Weekend stakes are Whitmore (Stoll Keenon Ogden Phoenix-G2), Miss Sunset (Thoroughbred Club of America-G2) and Bucchero (Woodford Presented by Keeneland Select-G2). Grade 1 stakes action on Fall Stars Weekend begins opening day with the 67th running of the $400,000 Darley Alcibiades for 2-year-old fillies going 1 1/16 miles on dirt. A Win and You're In race for the $2 million Tito's Handmade Vodka Breeders' Cup Juvenile Fillies (G1), the Darley Alcibiades drew 44 nominations headed by Joel Politi's Serengeti Empress. Trained by Tom Amoss, Serengeti Empress won the Pocahontas (G2) at Churchill Downs by 19½ lengths on Sept. 15 at the Darley Alcibiades distance. Prior to that, she won the Ellis Park Debutante by 13½ lengths. Whitmore is nominated to the 166th running of the $250,000 Stoll Keenon Ogden Phoenix, a Win and You're In race for $2 million TwinSpires Breeders' Cup Sprint Owned by Robert LaPenta, Head of Plains Partners and trainer Ron Moquett's Southern Springs Stables, he won the Forego (G1) at Saratoga in his most recent start. Among the 23 nominees to the 6-furlong dirt test are 2017 champion male sprinter and Breeders' Cup Sprint winner Roy H; H. Allen Jerkens Presented by Runhappy (G1) winner Promises Fulfilled; and multiple graded stakes winner Limousine Liberal. The Shadwell Turf Mile anchors an 11-race card on Saturday, Oct. 6. Post time for the first race that day is 12:40 p.m. (but is 1:05 p.m. on all other days). The 105th running of the $500,000 Claiborne Breeders' Futurity (G1) for 2-year-olds at 1 1/16 miles on dirt attracted 56 nominations. The race is a Win and You're In test for the $2 million Sentient Jet Breeders' Cup Juvenile (G1). Included among the nominations are Hopeful (G1) winner Mind Control, Iroquois (G3) winner Cairo Cat and multiple graded stakes-placed Tight Ten. The third Grade 1 race on Oct. 6 is the 21st running of the $400,000 First Lady for fillies and mares going a mile on turf. Attracting 27 nominations, the First Lady is a Win and You're In race for the $2 million Maker's Mark Breeders' Cup Filly and Mare Turf (G1). Chad Brown trains four nominees, including Grade 1 winners A Raving Beauty (GER) and Off Limits (IRE) plus Ballston Spa (G2) winner Quidura (GB) and multiple graded stakes winner Rymska (FR). Alan Klein and Phil Lebherz's Miss Sunset, trained by Jeff Bonde, tops a roster of 25 nominees to the 38th running of the $250,000 Thoroughbred Club of America (G2) for fillies and mares going 6 furlongs on dirt. The race is a Win and You're In dash for the $1 million Breeders' Cup Filly and Mare Sprint (G1). Among the other nominees are 2017 TCA runner-up Chalon and Grade 2 sprint winners Ivy Bell, Lucy N Ethel, Mia Mischief, Stormy Embrace and Vertical Oak. 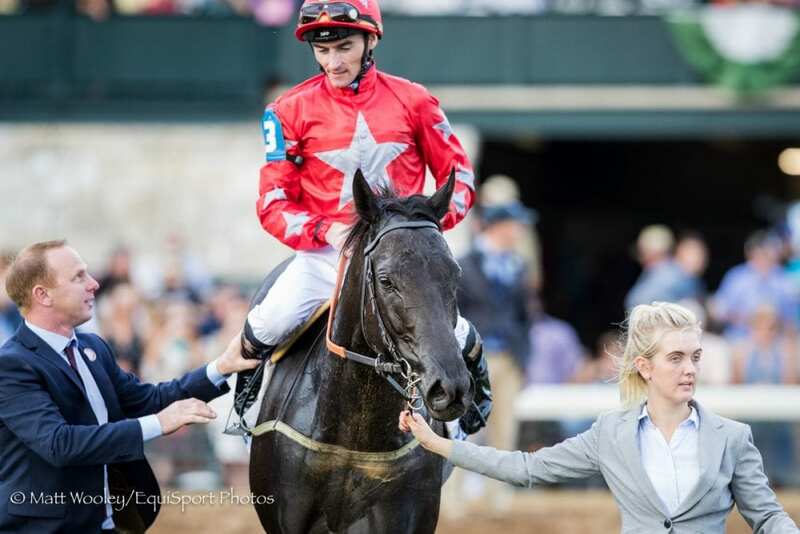 Ironhorse Racing Stable's Bucchero, who sprang a 26-1 upset in the 2017 Woodford, tops a list of 35 nominees to the 22nd running of the $200,000 Woodford Presented by Keeneland Select for 3-year-olds and up going 5½ furlongs on the turf. Trained by Tim Glyshaw, Bucchero finished fifth in the 5-furlong Turf Monster (G3) at Parx on Sept. 3 behind other Woodford nominees Pure Sensation, Vision Perfect and Rainbow Heir. The fifth Grade 1 event of Fall Stars Weekend is the 63rd running of the $500,000 Juddmonte Spinster for fillies and mares going 1 1/8 miles on dirt. Scheduled for Sunday, Oct. 7, the Juddmonte Spinster is a Win and You're In race for the $2 million Breeders' Cup Distaff (G1). The Juddmonte Spinster drew 23 nominations headed by the nation's top 3-year-old filly, Monomoy Girl, and Alabama (G1) winner Eskimo Kisses. Completing the Fall Stars Weekend lineup on Oct. 7 are two Win and You're In races for 2-year-olds, the 28th running of the $250,000 Dixiana Bourbon (G3) and the inaugural running of the $200,000 Indian Summer. The Dixiana Bourbon, which drew 54 nominations, is run at 1 1/16 miles on turf and is a Win and You're In for the $1 million Breeders' Cup Juvenile Turf (G1). Heading the nominees is Opry, winner of the With Anticipation (G3) at Saratoga, undefeated Kentucky Downs Juvenile winner Henley's Joy and Del Mar Juvenile Turf winner King of Speed. The Indian Summer, slated for 5½ furlongs on the turf, is a Win and You're In for the inaugural $1 million Breeders' Cup Juvenile Turf Sprint. The Indian Summer drew 49 nominees, 11 of which are trained by Wesley Ward. Among the Ward nominees are Shang Shang Shang, winner of the Norfolk (G2) at Royal Ascot; Stillwater Cove, winner of the Bolton Landing at Saratoga; and Moonlight Romance, winner of the Kentucky Downs Juvenile Turf Sprint. The $1 million Shadwell Turf Mile (G1), $500,000 Claiborne Breeders' Futurity (G1) and $400,000 First Lady (G1) on Oct. 6 will air from 4:30-6 p.m. ET. The following day, NBC will broadcast the $500,000 Juddmonte Spinster (G1) and $250,000 Dixiana Bourbon (G3) from 4:30-6 p.m. This entry was posted in Breeders' Cup, NL List and tagged Breeders' Cup Challenge Series, Breeders' Cup Win and You're In, Keeneland, keeneland fall stars, Keeneland Fall Stars Weekend, Keeneland Racecourse by Press Release. Bookmark the permalink.